In Switzerland Nancy and I visited the Grossmunster church which I had heard much about. It was built around 1100. The weird name means “great minister.” Truly it had a “great” ministry in Zurich and Switzerland during the Reformation. Here is why it important today. Zwingli, the pastor in the early 1500’s, became convinced this Catholic church should abandon icons, images, holy relics, mass, indulgences, celibacy, and fasting. He opposed mandatory fasting rule for lent by distributing smoked sausages during lent of 1522. This became known as the Affair of the Sausages and is considered the beginning of the Swiss Reformation. You might say Luther started with his 95 thesis while Zwingli did it with smoked sausages. Zwingli wanted a return to the clear teaching of Scripture like Luther did in Germany. Until that time few people had bibles. The church taught a works salvation through the mass rather than salvation by grace through faith in Christ alone. In other words he wanted a return to the Gospel. Walking into the church prior to 1500 you would have seen statues, icons, crucifix, altars, and other glitter. Zwingli stripped the building plain of these things as well as the organ, and singing even though it is said he played twelve instruments. He also removed the pews and anything that he thought would hinder a focus on the teaching of the Word of God. 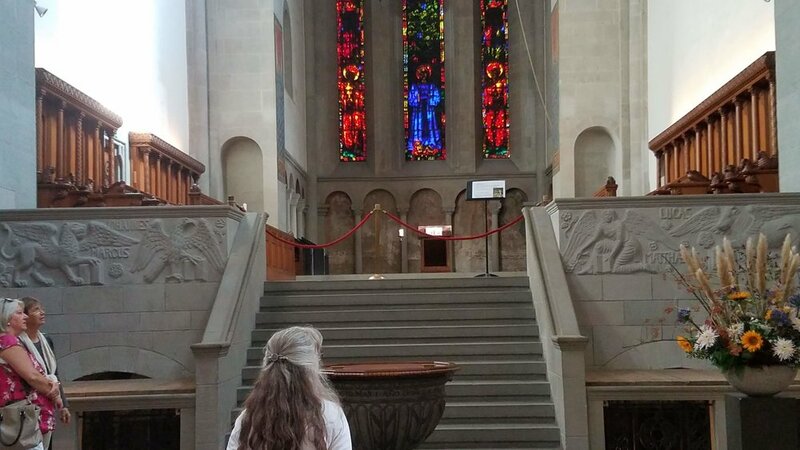 Nancy looks to where the wide pulpit once had been. The inside as it is today with pews and the side pulpit that replaced the central wood one Zwingli used. For one event he ordered a new wide pulpit be made for the center of the platform rather than to the side as in most churches. Being central emphasized the centrality of the preaching of the Word of God. This is why ours is central. The pulpit was made of wood from altars previously used in the mass. Therefore as Zwingli preached he was trampling under foot the theology of the mass that repeatedly put Christ on the cross. He made his point with every step he took. Sadly, when we visited, the wide pulpit was gone being removed in 1865 and a side mounted round one was built. During this time bibles had begun to be printed and people were learning to read thanks to the concept of schools which John Calvin had initiated in Geneva. As people read the Bible they began to understand their sinfulness, repentance, and God’s simple plan of salvation. This revolutionized Zurich and other parts of northern Switzerland and spilled over into other countries. Once you have traveled you begin to see how the true gospel of free grace affects cultures beyond church walls. My son Caleb noted that in reformation countries the churches are more plain and the society is more concerned for cleanliness, order, and beauty because of having a biblical view of life. Northern Switzerland is like this with tidy streets, beautiful flowers, little graffiti and a rail system that runs like a Swiss watch. On the other hand in non reformation areas you are more likely to find extravagant temples with elaborate gold leaf, many images etc.. But the surrounding society lives in a more rundown situation, more graffiti, and less care each other. This is obvious in other places in Switzerland or Malta where the reformation did not happen. The message of the Grossmunster is clear. When the bible is clearly proclaimed it affects people, how they live, and society for generations. Before we left we climbed the 187 ancient stairs to the top of one of the twin steeples. We saw a breathtaking view of the modern city that has largely forgotten the Gospel. But it still is beautiful and orderly like a Swiss watch because of what happened in the 1500’s. View from the top of the steeple in Zurich. It is good for us to understand history of places like this and how God worked through imperfect people to spread the gospel for the generations to come. So pray for the churches there today to be gospel focused. Men don’t forget our monthly 8 AM Men’s Discipleship is moved to the 4th Saturday this month. If any of you guy have not joined that group in the Community then please do so you can get the automatic updates.